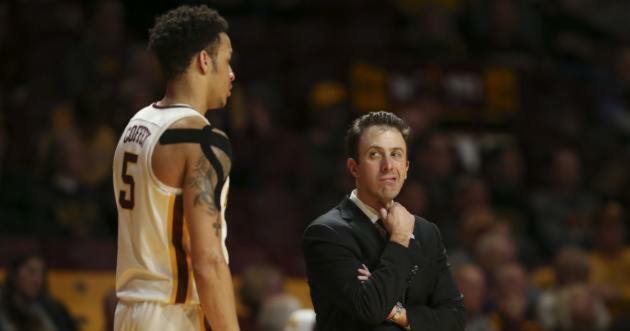 Gophers coach Richard Pitino said Friday that junior guard Amir Coffey practiced this week, which is a big step toward him being ready going into the 2018-19 season. Coffey, who spent most of the summer recovering from February shoulder surgery, averaged 14 points, four rebounds and three assists last season, but he missed 14 games with injuries. "Amir practiced the other day, so he's moving towards (a full recovery)," Pitino said. "When you bring him back, he's not 100 percent full go just yet. Until my trainer tells me they're 100 percent can do everything I consider them injured. But he's looking better." Pitino's also encouraged by the progress of freshman center Daniel Oturu, who could be seen dunking on a Instagram video this week. Oturu is on schedule to be ready by the start of fall practice with the Gophers after being sidelined from reconstructive shoulder surgery in April. Summer practice ends Aug. 3. "I think he's doing well," Pitino said . "We're winding down the summer and we'll get back up again in late August. I don't think he's far away." The 6-foot-10 Oturu will be counted on for heavy minutes in the middle this season. Redshirt sophomore Eric Curry has practiced this summer, but he's not cleared for contact after missing last season with a knee injury. Arguably the best view in Williams Arena for men’s and women’s Gophers basketball games is from the balcony seating, where members of the media have been sitting for, well, a very long time. That is about to change for the first time next season. Media, including myself will be shedding a tear in November, but fans now get the chance to purchase what the Gophers are calling “balcony club” seats for the 2018-19 season. Season ticket holders for basketball will get first crack. They were sent emails Thursday about the new upstairs premium seating opportunity, which will include approximately 24 leather seats. Those interested need to opt in to the upgrade process, if they haven’t done already. That process begins next week on Monday. The cost is $3,500 per seat for men's basketball and $750 for women's basketball. Fans who purchase two balcony club seats will get access to the Barn’s club room. Once the season ticket holder upgrade process is completed, any remaining seats will be available to the general public, according to the Gophers. Gophers Score points are used in the ordering process, as typical for other ticket upgrades. Contact the Gophers’ Fan relations department for more info. Another seating change this season will be all courtside media being moved up to Section 203, which will be closer to the media room. Those press row seats will now be available for purchase as well.